Visit Los Angeles, San Francisco and Hawaii on this 12 night Hawaii holiday. Fly onwards to the Hawaiian island of Big Island, spending 7 nights at the Sheraton Kona Resort & Spa at Keauhou Bay. Situated on the iconic lava rocks of the Kona coast. This hotel offers guests some unique experiences from lava water slides, a healing salt room in the fabulous spa to ocean view restaurants, a fantastic hotel in an idyllic setting. Fly back home via San Francisco, breaking up the journey with 3 nights at the Triton hotel San Francisco, not far from the high-end shopping at Union Square and a short distance from Chinatown. This hotel is ideally located for exploring this iconic city. Ask our Hawaii team about the must see tours and attractions. 2 nights at the Comfort Inn Near Universal Studios Hollywood, Los Angeles. 7 nights at the Sheraton Kona Resort & Spa at Keauhou Bay, Big Island Hawaii. 3 nights at the Hotel Triton 4 STAR Hotel,San Francisco. Hawaii is an idyllic destination to relax and unwind, whilst taking in the naturel beauties of earthâ€™s wonders, there is so much to choose from, thatâ€™s where speaking to a specialist makes all the difference. Your Hawaii holiday is maybe a once in a lifetime experience and we aim to make it extra special. 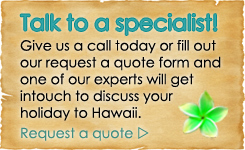 Give us a call or send an enquiry and allow us to start planning your fabulous Hawaii holiday.